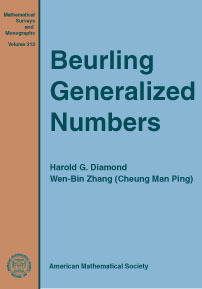 “Generalized numbers” is a multiplicative structure introduced by A. Beurling to study how independent prime number theory is from the additivity of the natural numbers. The results and techniques of this theory apply to other systems having the character of prime numbers and integers; for example, it is used in the study of the prime number theorem (PNT) for ideals of algebraic number fields. Using both analytic and elementary methods, this book presents many old and new theorems, including several of the authors' results, and many examples of extremal behavior of g-number systems. Also, the authors give detailed accounts of the \(L^2\) PNT theorem of J. P. Kahane and of the example created with H. L. Montgomery, showing that additive structure is needed for proving the Riemann hypothesis. Other interesting topics discussed are propositions “equivalent” to the PNT, the role of multiplicative convolution and Chebyshev's prime number formula for g-numbers, and how Beurling theory provides an interpretation of the smooth number formulas of Dickman and de Bruijn. Graduate students and researchers interested in analytic number theory. The book is very well written and should prove accessible to a fairly large audience, requiring only some familiarity with mathematical analysis and classical techniques from analytic number theory.